With measurement of LAeq and LCPeak, the CEL620B Sound Level Meter is ideal for noise at work assessments. The CEL620B2 is a Class 2 Integrating Sound Level Meter, making it ideal for most occupational and general purpose noise assessments. It can also be used for more detailed noise surveys that require frequency analysis using Octave Band Filters. This is a data logging meter, so it can store measurements for download to a computer. Software is included in the hire kit, or you can even transfer the measurements into Excel or similar spreadsheet without installing any software at all. It is essential that a sound level meter meets the correct standards for any measurements that could be used for the protection of hearing or any other legal reasons. 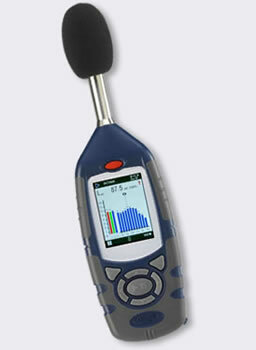 The CEL620B meets the correct standards for noise at work measurements (see Applications section). If you are unsure of the standards required for other regulations then please call or email for advice. This sound level meter is the correct specification for all occupational and noise at work assessments being carried out in line with the EU regulations and the UK HSE guidelines. These regulations require the use of an integrating sound level meter that meets the IEC 61672 standard to Class 2. The meter should be capable of measuring LAeq and LCpeak. The CEL620B2 is suitable for any general purpose noise measurement that demands the use of a Class 2 Sound Level Meter or Class 2 Integrating Sound Level Meter. The noise at work regulations state that the meter's calibration should be checked before and after making measurements. Press the Run/Stop key to start a measurement. Once the measurement is complete (e.g. the LAeq average level has settled) press the Stop key. The hire kit includes the Insight software for downloading and reporting. If you don't want to install software then you can just plug the meter into your computer's USB port and it will act like a memory stick. Measurements can be copied straight from the meter and loaded into Excel, Word or similar software.